This talk from physicist Lawrence Krauss is fascinating. It’s a masterclass in how scientists and narrative are bound together – it tells stories about the universe, as science believes at the moment it really is – 13.72 billion years old, flat in a 3D sense and expanding at an accelerating rate. Scientists and atheists like Depth Deception, Brother Richard, Prometheus Unbound and The Good Atheist love it, although all for different reasons. The problem is that the questions of interest to science drive the narrative, in a way that is far from scientific or rational. 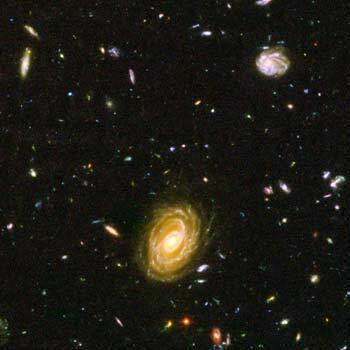 For example, he argues that less than 1% of the universe is planets and stars and all that we see and are. The rest is dark matter (30%) and dark energy (70%). So on the scale of the universe, we’re completely insignificant. As tongue in cheek as this talk is, there is something serious going on. Atheists, like everyone else that ever lived, need their stories. The success of this talk clearly derives from this need. What is more there’s clearly a quasi-theological argument going on. The fact the universe is “flat”, for example, means the total energy is zero so you don’t need to posit the existence of a deity to have kicked it off (as if that is what physicists would posit if the universe were not “flat”). One of the reasons the talk is so engaging is that Krauss’s universe seems to have a character, but that character is of a massive, cold and uncaring thing – like a god who doesn’t care. But the universe has no character whatsoever. It’s size is not, for instance, large – there’s no comparison for that word to make any sense. In one way, I’m being pointlessly sour. This is just funny stuff about the universe, meant to make you think, to communicate the facts in a fun way. But sadly, this stuff is the closest atheists come to having something to believe in. And in this talk, the overriding narrative is fundamentally confused. The trouble is, Krauss’s cosmic narrative is generated as a way of interesting us in the facts and does not seem thought through as a narrative. There is a feeling that the narrative naturally follows when you know the facts. It is obvious that our lives are insignificant when you know the scale of the universe. It is obvious that our lifespans mean nothing when you know the timescale of the universe. But these things simply are not true. The cosmological calculus has no necessary bearing whatsoever on whether or not we think life is special, purposeful or good. The value of life is not found naturally occurring in the universe – thats a religious thought. We make up the values, not the stars. If we want to think life is special we can construct a narrative to do that – using whatever tools we chose. The facts by themselves are only physically or causally connected. The conceptual connection is made up by us and simply does not exist in the universe before we find it there. So whether we chose to fit a story about the universe and the people curious enough to find out about it into a good story or bad is up to us. We decide. Humans have to believe in something and it is irrational not to make the most of this ability. It is a cowardly lie to pretend the narrative forces itself upon us. (Although I don’t think Makouli will agree). Why not believe in something good, that our lives are meaningful, that there is a point to existence? This talk gives much to inspire, but does much to purposfully destroy all faith in life at the same time. Truthful words, some authentic words dude. You rocked my day! !